ESPN, ABC, and Univision are having record broadcasts of 2014 World Cup games, but next time around won’t be able to air them. Broadcast rights will transfer from Disney and Univision networks to Fox Sports (English) and Telemundo (Spanish) for the 2018 World Cup. Telemundo will also air the Spanish-language games in 2022. The network reportedly paid $600 million for the rights to the two tournaments–up 85 percent from the $325 million that Univision paid for the previous two tournaments–and other soccer coverage. The deal starts on July 15, 2014. The deal reflects a growing viewership in the United States of both English and Spanish broadcasts. Famed announcer Andrés Cantor–who is calling his eighth World Cup in a row–will plan to call his ninth in 2018. Cantor was instrumental in helping Telemundo land the rights, Jorge Hidalgo, Telemundo’s executive vice president of sports, told the Los Angeles Times. Telemundo will also broadcast the 2015 and 2019 Women’s World Cups, among other football events. Correction: A previous version of the article misidentified Cantor’s employer. He works for Telemundo. 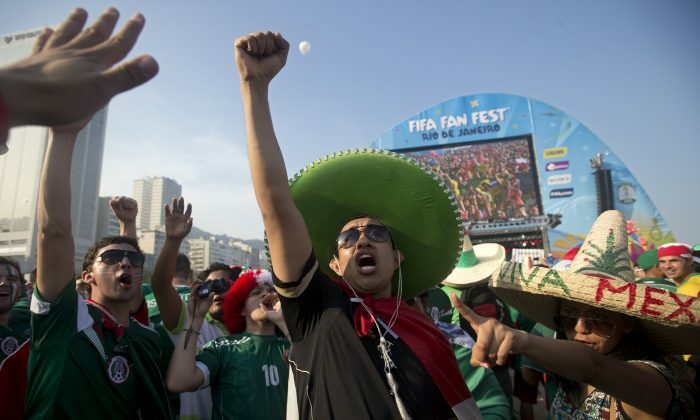 See an Associated Press update for the 2014 World Cup below. Italy has taken Spain’s famed “tiki-taka” system and revamped it to deal with Brazil’s heat and humidity. The Azzurri mesmerized England by completing an astounding 93.2 percent of their passes during a 2-1 win on Saturday according to data company Opta Sports — the highest accuracy recorded in a World Cup match since the statistic began to be recorded in 1966. FIFA, however, gave Italy an 89-percent passing completion. For long stretches, Italy’s midfielders simply passed the ball back and forth between themselves. It was a strategic decision to deal with stifling conditions at the tournament’s Amazonian venue of Manaus. Expect more of it on Friday when the Azzurri face Costa Rica in Recife, where kickoff could come under a torrid sun at 1 p.m. local time (12 p.m. EDT/1600 GMT). “(Coach Cesare) Prandelli invented our style of play by adapting to our characteristics,” midfielder Daniele De Rossi explained Tuesday. “We don’t have players that make runs for 40 or 50 meters (yards) without touching the ball. We get the ball to our most skillful players without squeezing the energy out of them. No wonder Prandelli used six midfielders against England in a 4-1-4-1 formation. De Rossi lined up just in front of the defense, and wingers Antonio Candreva and Claudio Marchisio surrounded central midfielders Marco Verratti and Andrea Pirlo. By the time Italy scored the opening goal Saturday, England didn’t know how to react. On a corner, Candreva made a short pass to Verratti who slipped the ball across the pitch toward Pirlo, who stepped over it to fool the defense and let Marchisio find the target from beyond the area. “We’ve had a strong midfield for many years now and this one is especially rich with players who have different qualities and complement each other,” De Rossi said. Pirlo is the player with the most touches (117) and passes (108) so far at the World Cup, according to Opta. He completed 103 passes with only five failed deliveries against England. De Rossi completed 99 passes, Verratti had 59 and all 26 passes from substitute Thiago Motta reached their destination in his 33 minutes of action. “Few squads can match the quality we have in the middle of the pitch,” Prandelli said. The numbers approach what Barcelona achieved in the 2011 Club World Cup final won 4-0 over Brazilian side Santos, when Xavi Hernandez completed 102 of 103 passes and Andres Iniesta a perfect 101 of 101. Still, Prandelli would like to see some changes against Costa Rica.